We’re all so darn busy. I thought “The Information Age” was supposed to make us more efficient so we’d have more time. More time for our families. More time to enjoy the things we like to do. So much for that. We’re all busier than ever. We don’t seem to have time…for much. That’s Why I Put This FAQ Page Together. What follows are FAQ’s. Some of the questions I’m frequently asked. If you have one that’s not listed below, go here to ask me. 1. Why are you called The Franchise King? I looked around. I didn’t see a “King” anywhere. Then he pointed at me, and the rest is history. It’s my brand. Heck-it’s even trademarked, thanks to a smart suggestion by my friend, Jim Kukral. 2. What exactly do you do, Franchise King? I provide straightforward advice to people who are interested in franchise ownership. The information I offer will help you…big time. Learn all you can about franchising through my…. My franchise ownership products are available in print, digitally, and even through audio. 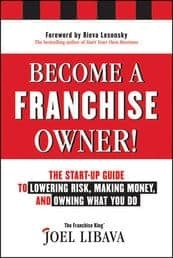 Please take a look at my hardcover franchise book, my eBooks, and my comprehensive online franchise courses. I’ve written over 2,000 different articles on just about every aspect of franchising. A good deal of them can be found on my award-winning franchise blog. And, many, many more websites/blogs, and magazines etc. In addition, I write a monthly article for SBA.gov, the official website of The U.S. Small Business Administration, and Franchise Direct.com, a very popular franchise opportunity website. I offer private, 1-on-1 Franchise Ownership Consultations. * I even include a 100% Money-Back Guarantee when you work with me. Check out what my consultation packages include. *I’m not a huge fan of asterisks, but this is important. 3. Joel, where on your website can I find information on specific franchise opportunities? I occasionally show interesting franchise opportunities. Some of them I have marketing relationships with (which I disclose), and some of them are too cool to not share with you. When you have a chance, check these franchise opportunities out-you’ll see what I mean. 4. Do you offer free franchise/business tools that I can use? If you want to make sure you have the right stuff to be a franchise owner, you can take this free franchise quiz. Have you figured out your financial situation yet? Use my free net worth calculator so you’ll know where you stand. My Castle is located in Northeast, Ohio-a few miles from the Rock-N-Roll Hall Of Fame. 6. Why does it seem that you’re so hard on franchisors-and on the International Franchise Association (IFA)? My goal is to make franchising better. I want franchisors to only award franchises to people that ave enough money and that are truly a fit for their specific concepts. Some do it. Some don’t. Occasionally I call out franchisors that in my opinion, aren’t doing the right thing. These franchisors don’t like it-and pretty much don’t like me. I don’t care. If I can save my readers, Newsletter subscribers, or my Fans/Followers money and aggravation, I will. Every time. And, I want today’s franchise buyers (you?) to be careful. I want them to go slow and steady. I want them to make sure they get all the facts. That’s why I provide straightforward-and sometimes not very gentle tips and suggestions. In a perfect world, franchisors choose the right people and prospective franchise owners choose the right franchises for them. Ones they can make money owning. Ones they can be proud to own. And, the franchisors provide awesome support and keep innovating so their franchisees never run out of great products and services to offer their customers. One more thing: Franchisees can sell their franchise business for a nice profit and live out their years comfortably. I’m hard on the IFA because of the direction they chose to go. The IFA isn’t much of a franchise organization anymore-it’s been transformed into a Washington D.C. lobbying organization. Just what we need, right? Another self-centered group that buys and sells high-powered politicians that vote in ways that may or may not align with the direction of our country-or what the majority of it’s PEOPLE want. That’s why I’m hard on the International Franchise Association. 7. Are you active in social media? Go to my blog, and scroll down 3/4 of the way. On the left-hand side, you’ll see logos for the social media networks I’m active on. Let’s connect! I share lots of stuff. Serious stuff and funny stuff. Take a look at my very active Facebook Page-and please give me a Like. Okay?